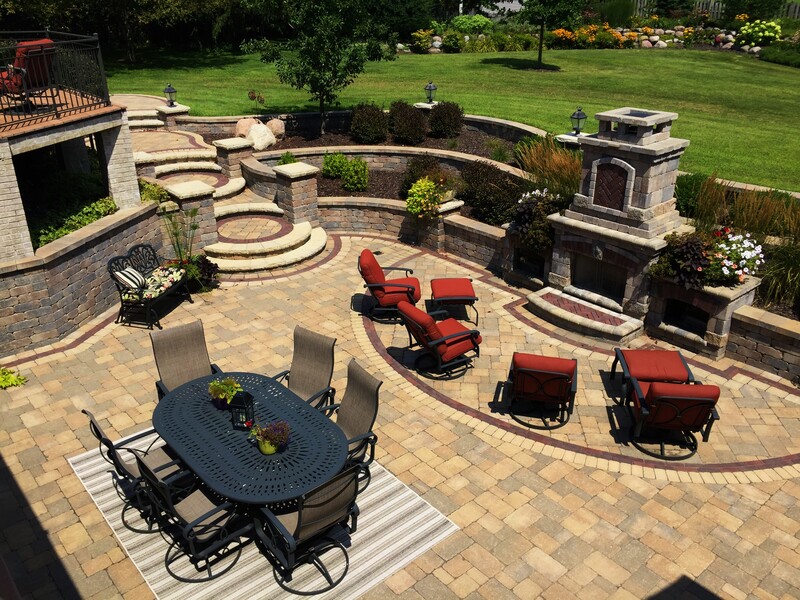 Crimson Valley Landscaping is the Greater Rockford area’s leader in brick paver design and installation. Our experienced crews construct beautiful outdoor living and entertaining spacesfor a wonderful backyard getaway. While, our inviting and unique entrances and walkways give a home fantastic curb appeal. Our professional team is passionate about designing and installing quality landscape projects; all backed by our lifetime warranty on hardscape products and our 10 year installation guarantee. We are an Authorized Unilock Contractor and are knowledgeable in the use of a wide variety of products, including Unilock, Silver Creek, Paveloc, and more. Each brand is available in an array of colors and styles. Crimson Valley integrates retaining walls into any landscape setting. From small garden walls to expansive commercial property retaining systems, our professional products and seamless installations are backed by a lifetime warranty on concrete block materials and a 3-year guarantee on our installation. Depending on the landscape project, we will assist you in selecting a landscape material that is suitable for your site. Our product list includes Unilock, Keystone and Paveloc brands. Crimson Valley Landscaping is an Authorized Unilock Contractor. Many of our retaining wall systems are also suitable for natural stone construction; bluestone, flagstone, cut drywall, outcropping and boulders are a unique way to bring a one-of-a-kind product into your garden landscape. Natural stone is just that natural; no two pieces are exactly alike, simply beautiful! In addition to our award-winning technique and impeccable retaining wall design and construction, we use concrete retaining wall blocks and natural stone to build stoops, garden walls, seat walls, and decorative columns to complement your retaining wall or brick paver design. If you are looking for an environmentally friendly approach, try a new vegetation wall! This system is highly effective for any retaining wall application, large or small. It is the only permanent eco-friendly solution for controlling erosion and retaining soil. The sustainable soil bags are interlocking and a truly exceptional system for retaining. Plant the face of the wall with a combination of shrubs, perennials and groundcovers or hydroseed for a “green” retaining wall. Natural stone is a great selection for many landscapes. Our natural stone crew specializes in the meticulous construction of natural hardscaping products. Natural materials are unique and no two pieces are exactly alike. The color, shape, size and textures of the products vary. Our skilled team of stone specialists creates one-of-a-kind outdoor rooms and landscapes featuring bluestone, limestone, boulders, outcropping stone, flagstone, cut drywall, and other natural stone materials. Natural stone products are a unique way to turn any space into an incredible outdoor living area. Stone construction gives any landscape a luxurious and distinctive look. Natural stone differs from brick pavers in a sense that brick pavers are a manufactured concrete material. Stone is a natural and more complex product and installation. Use flagstone for patios and walkways or for steppers throughout the garden. Flagstone is available in an irregular stone or in cut pieces for a more formal patterned or contemporary look. Use different types of stones for many landscaping and gardening applications. Cut drywall is used for a dry-stacked stone wall or mortared for a sophisticated facade. Cut drywall stone is excellent for freestanding garden walls or retaining walls, also making stunning outdoor kitchens and outdoor fireplaces. Boulders and outcropping stones range in size from smaller to very large stones; we use these stones for ponds and waterfalls, retaining walls and garden accents. We create beautiful outcropping benches for a unique garden vignette seating area, a truly unique garden accent feature. Even in northern Illinois and southern Wisconsin, you can enjoy the soothing sights and sounds of water features in your landscape. We design and install ponds, waterfalls, pondless water features and fountains to complement your home and landscape. Water features are a great addition to the backyard landscape; relax and unwind in your wonderful outdoor living retreat.